Before I’d read a page of Donna Tartt’s newest book, The Goldfinch , I saw several reviewers call the novel “Dickensian,” and so going in was already prejudiced to consider the book in that light. But even if I hadn’t been so influenced, The Goldfinch would have evoked David Copperfield and Oliver Twist almost immediately. Don’t get me wrong; I love Dickens. David Copperfield and A Tale of Two Cities are two of my favorite books of all time. In fact, I credit the latter has having a particular influence on my moral compass. Dickens’ novels deserve all the praise and continual study given them by literature professors. I feel I should also say that I absolutely love Tartt’s debut novel,The Secret History . If you haven’t read it, run to your nearest bookseller and buy a copy, then be prepared to lose a few days because it is a book you just can’t put down. Conversely, I very strongly disliked her second novel, The Little Friend , which I found ponderously boring. The Goldfinch is a hybrid of the two; parts of it are impossible to put down (particularly the last third of the novel), while other parts are so overwritten and slow that I deliberately started skimming until the story took up again. It is in these passages that genetics of Dickens are so obvious. In fact, I often forgot the book’s contemporary setting; with very few changes, The Goldfinch could be a Victorian novel (or any time period since, for that matter). For the first few dozen pages, I thought the book was set in the 40s or 50s; it wasn’t until the story’s hero and narrator, Theo, used a cell phone that I realized the action took place much more recently than that. 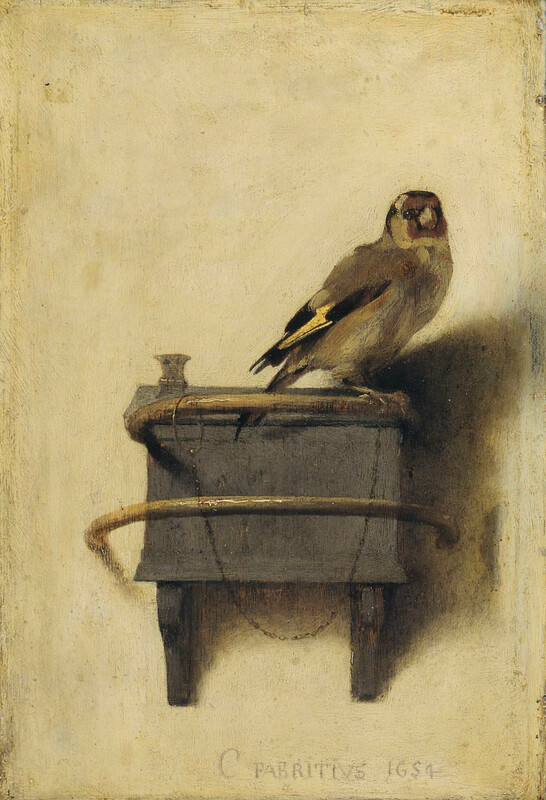 The story is staged as the diary of Theodore Decker, who as a young boy comes into the possession of the titular painting, “The Goldfinch” by Carel Fabritius. The narrative follows the young orphan (another similarity to Dickens) as he is passed from one reluctant guardian to another. Theo’s youth is so painfully detailed that the first half of the book creeps along. Tartt makes you feel every moment of Theo’s post-traumatic stress, from the disorientation and pain in the first few moments, to the panic in the hours after, to the drug-induced haze and numbness of the months and years that follow. All of which is interesting. What quickly becomes tedious are the long passages of description about Theo’s environment, or his illnesses, or his escapades with Boris in an abandoned neighborhood. That’s where I started skimming, and that’s what I feel should have been pared down. The book is a massive 770 pages, but it could easily have been half that and been a much tighter, more compelling novel. These long-winded detours often made me forget the story’s contemporary setting, so that when Theo suddenly got a text message, it jarred me out of my immersion. Also jarring were the sudden jumps in time. The novel crawls along most of the way, and then suddenly jumps ahead several years like a bad splice in an old film. The dire threat of boarding school hangs over Theo’s head, and then jump Theo’s grown up and has a job and a relationship. It’s almost as if Tartt realized she’d been dragging things out and went too far the other way. But when the book takes off, it really grabs you. I lost most of a Saturday and several hours on Sunday to finishing The Goldfinch, because the last 200 pages or so are very tense. Granted, I was aggressively skimming the boring parts by that point, but the action gripped me nevertheless. The ending disappointed me a bit, regretfully. While I won’t spoil it for you, I will say that it ties things up a bit too neatly. It almost feels like a deus ex machina, although technically it isn’t. So, bottom line: do I recommend The Goldfinch? Yes, I do, but learn to recognize the detours into exposition early on and skim them. You’ll enjoy the novel much more that way, and the jagged seams may not stand out as much. On an unrelated note, today is the day Olen Steinhauer’s brilliant espionage novel, The Cairo Affair, hits the shelves. I reviewed it a while back, thanks to winning an advanced reader’s copy. If you like spy novels, pick it up! It may be the best book you’ll read this year. You are currently reading Writing about Reading: The Goldfinch at Kicking the Pants.